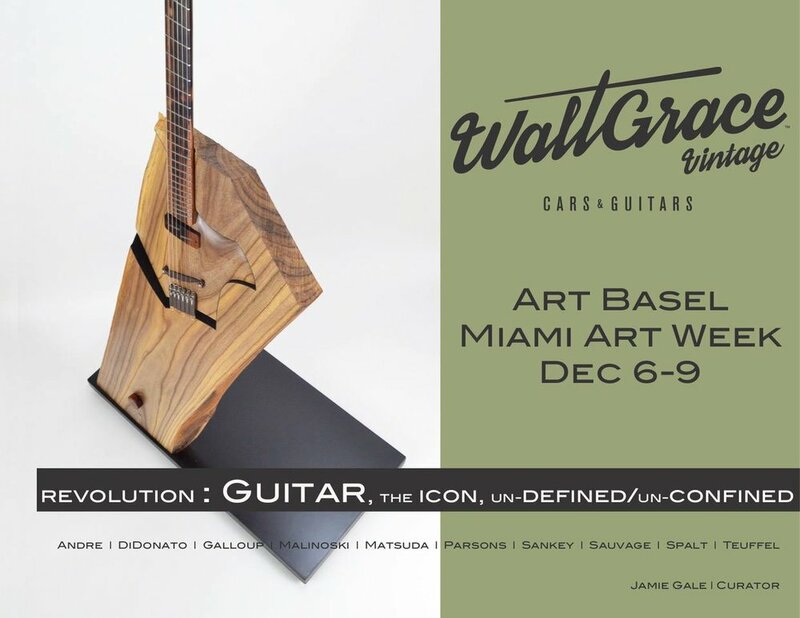 Created specially for the exhibition “Revolution: Guitar, the icon, un-defined/un-confined” as part of Art Basel’s Miami Art Week, When I fell, I sang, answers more than than the obvious rhetorical question, but also the question of whether guitars are or can be art. 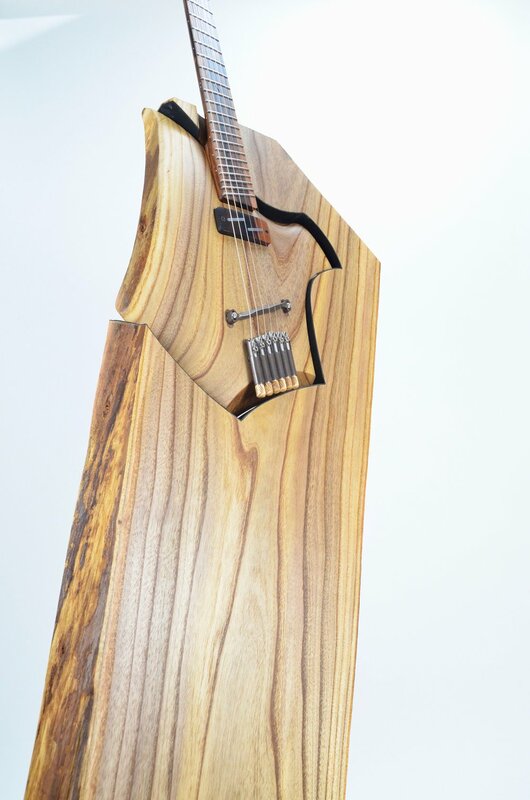 “When I fell, I sang” is a unique artistic creation, but it is also intended to be played, as a world-class quality guitar should be. The guitar section itself is carved directly from the larger slab. It is made of catalpa, a lightweight, resonant, and stable hardwood wood native to North America. All other wood parts are crafted of macassar ebony. The neck is reinforced and stabilized with a hollow carbon fiber tube, so no truss rod adjustments are necessary. The pickup is custom-made for this instrument by Ezi Pickups. 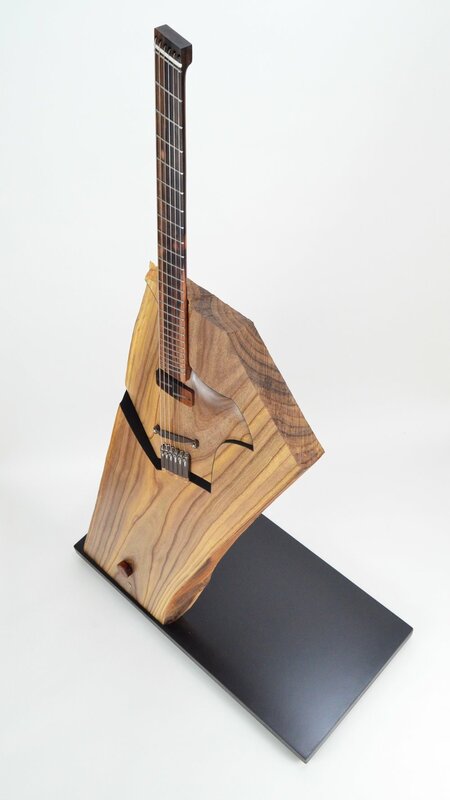 The bridge and tuners are my own unique design created using two different processes of 3-d printing in metal. 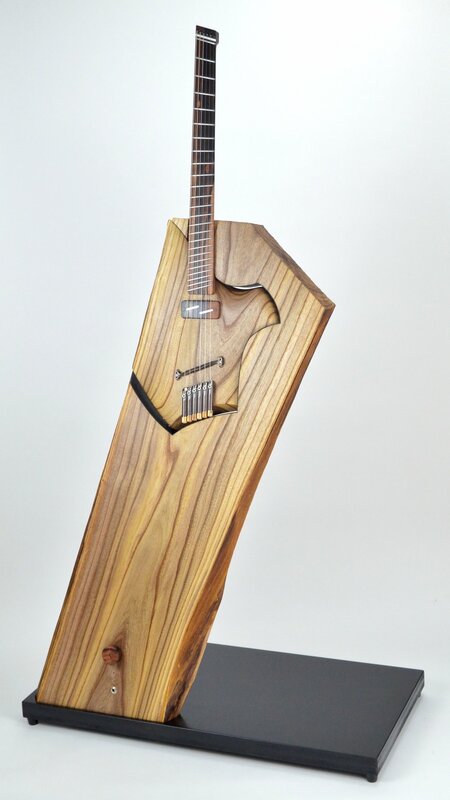 The main body of the piece contains a 20-watt class D stereo amplifer, as well as stereo drivers which excite vibrations in the wood itself, thus turning the slab into a powered speaker. On the front is a 1/4” input, and the single ebony knob is a volume control. The amplifier is designed for line level inputs; for best results it should be fed with the output of a preamplifier designed for guitar use, or alternatively with your favourite guitar effects pedal.